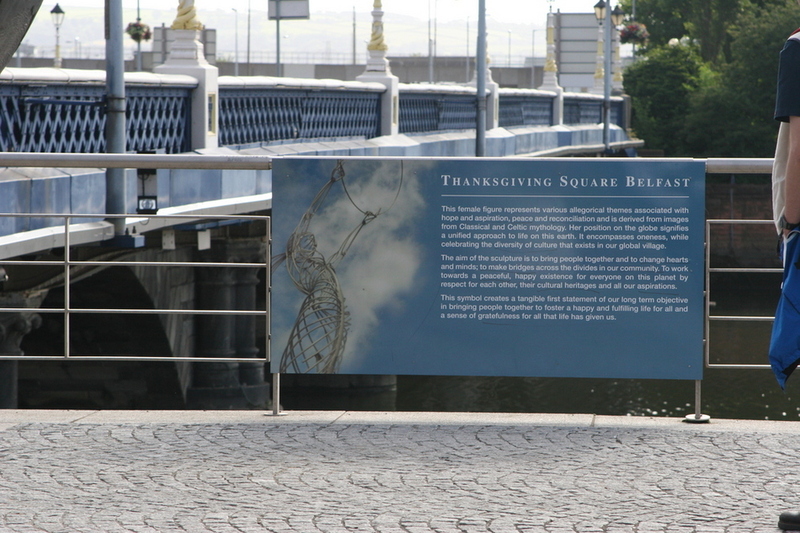 Thanksgiving Square Belfast sign along logan river at the left is Queens bridge. This female represents various allegorical themes associated with hope and aspiration, peace and reconcilliation and is derived from images from Classical and celtic mythology. Her position on the globe signifies a unified approach to life on this earth. It encompasses oneness, while celebrating the diversity of culture that exists in our global village. The aim of the sculpture is to bring people together and to change hearts and minds; to make bridges across the deivdes in our community. To work towards a peaceful, happy existence for everyone on this planet by respect for each other, their cultural heritages and all our aspirations. This symbol creates a tangible first statement of four long term objective in bringing people together to foster a happy and fulfilling life for all and a sense of gratefulness for all that life has given us.